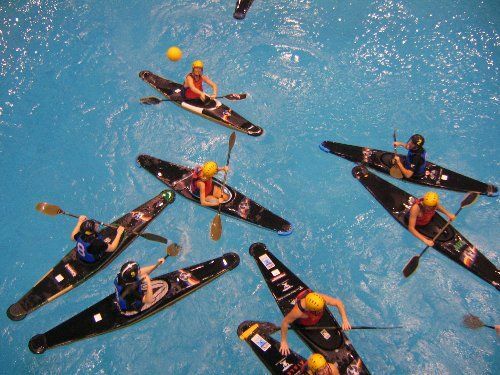 Canoe Polo, called kayak polo in some countries, is a ball sport on water, in a “field”, for two teams of 5 players (plus 1,2 or 3 subs) for two 10 minute halves, Teams play to get the ball into their own goal raised about 2 metres above the water. Each player paddles a ‘polo bat’ –3 metres long, specially designed, low volume, with protective bumpers at front and back. Players wear a protective buoyancy vest, a helmet with a faceguard and a fitted ‘skirt’/deck for keeping water out of the boat. Teams playing recreationally in Australia are gender mixed or gender specific depending on levels and reasons for ‘comps’. Beginner grades are now using a mix of small boats and sit-on-tops for encouraging young players. 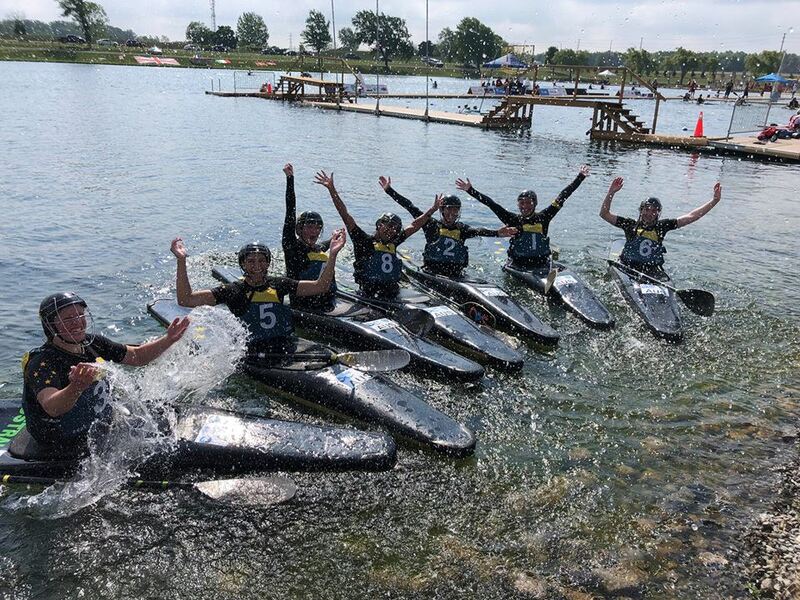 The canoe polo community is both family and elite level sport oriented and is run by volunteers. Players in possession of the ball can be ‘tackled’ by kayaks, ‘hand tackled’ on the shoulder and capsized (after beginner levels). Teams pass the ball by throwing or flicking with paddles and use paddles are to intercept passes and block shots at goal. The sport has World Championships every 2 years, internationally organized by the Canoe Polo committee of the International Canoe Federation. We are keen to promote development of canoe polo in SA regional districts. Would you like to try canoe polo or train regularly? Then the Canoe Polo Development Squad is the thing for you. First time or experienced paddlers welcome. There is a trial 3-month introductory membership to Paddle SA of $35.00 (for people under 18) and $50.00 for Adults which includes insurance. After the 3-month introductory membership, participants can join a club for an additional fee of approx $35 (children) for the year. A school with students and teacher who are keen to learn about this fast and exciting sport. 4 sessions (approx 1 – 2 hours duration each). Cost: Each student must join Paddle SA as a student member (valid for 3 months).Would you like to try Canoe Polo and train regularly? What does a student or school do to join in? Schools who have students who are interested to participate can arrange an information session by contacting Paddle SA on 8240 3294. Individual students can become part of the talent identification & coaching by contacting Paddle SA – 8240 3294. Where possible each school will need a teacher or parent who will act as a contact or coordinator to ensure interested students get information.